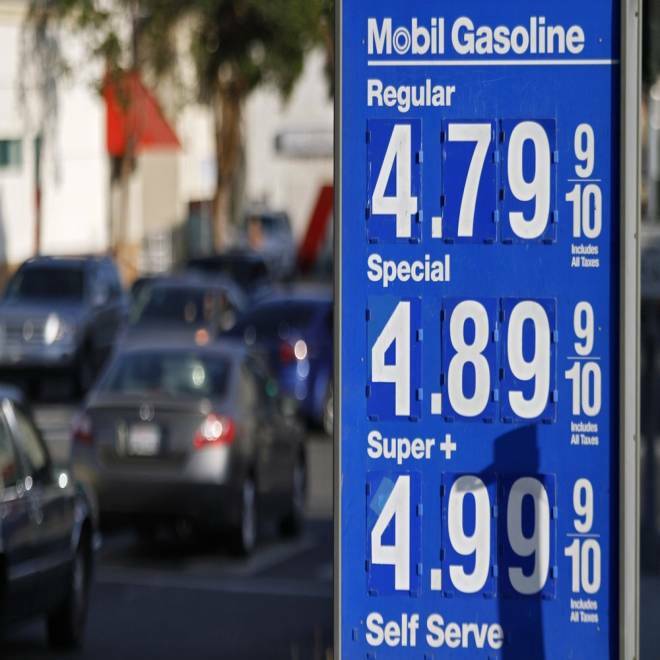 Gas prices soared in California last week, but they aren't nearly so bad in other states. By Michael B. Sauter and Alexander E. M. Hess, 24/7 Wall St. Since June, gasoline prices have climbed more or less steadily and are now 35 cents per gallon higher than they were a year ago. According to AAA’s daily fuel gauge report, which measures gas prices around the country, gas prices have hit daily record highs at least once in each of the past six weeks. In Michigan and Ohio, prices rose by 50 cents per gallon in the past year. As of Oct. 1, there were seven states with gas prices above $4 per gallon. While the price at the pump has risen in every state compared to a year ago, in some states the price of gas has increased at a much slower rate, and many are much closer to $3.50 than to $4 per gallon, well below the national average. In 10 states the average price of a gallon of gas is $3.60 or less -- 18 cents less than the national average of $3.78 per gallon. 24/7 Wall St. reviewed gas prices across all states. We found that one of the most important factors that determined price was a state’s geographic location. Being near refining capacity helps cut the cost of transporting gas. As a result, most of the states with low gas prices are located on or near the Gulf of Mexico, where the vast majority of the nation’s oil harvesting and refining takes place. Four of the five states that touch the Gulf of Mexico are among the 10 with the lowest gas prices in the country. Three more states on this list -- Arkansas, Tennessee and Georgia -- are immediately adjacent to one of the Gulf states. Gasoline taxes are another important issue that affects gas prices. Of the 10 states with the lowest prices, eight have among the 15 lowest taxes per gallon of gas. But the relationship between gas taxes and cost is far from perfect. Alaska has the lowest gas taxes at just eight cents per gallon, but the second-highest gas prices. Four of the five states with the lowest gas taxes, including Alaska, are not among the 10 with the least expensive gas. While national gas prices rose over the past year, they fell by five cents per gallon in the past month. The states on our list have been the driving force in that decline. Gas prices dropped in 23 states compared to a month ago. Gas prices in all 10 states with the cheapest gas price have fallen, including Georgia, where the cost per gallon is down by 24 cents. Based on AAA’s Daily Fuel Gauge report, 24/7 Wall St. identified the states with the least expensive average price of a gallon of unleaded gasoline as of October 2. AAA also provided the change in average fuel prices by state one week, one month and one year ago. 24/7 Wall St. also examined the number of refineries and total refining capacity as of January 1, 2012, provided by the U.S. Energy Information Administration. From the American Petroleum Institute, we obtained state gas taxes, which were also as of the beginning of this year. This includes state gas excise taxes, as well as other taxes (including sales tax). 24/7 Wall St. also obtained the relative overall cost of living, and the cost of paying for transportation, from The Missouri Economic Research and Information Center for the second quarter of 2012. These are the states with the cheapest gas. Nowhere is gas cheaper than in South Carolina, where gas is 28 cents per gallon cheaper than the national average, and three cents cheaper than the second-cheapest state, Mississippi. Contributing to low prices are some of the lowest gas taxes in the country; South Carolina charges an excise tax of just 16 cents per gallon and other fees and taxes of only 0.8 cents per gallon. On September 15, 2008, prices hit their historical peak in the state, at $4.12. In June, gas prices fell below $3 per gallon. Last year, Mississippi had a median household income of just $36,919, making it the poorest state in the country by that measure. Although the state’s economy is suffering, there has only been a 25 cents per gallon increase in Mississippi’s gas prices over the past year, compared a rise of 36 cents nationally. The state currently charges just 18.8 cents in state taxes per gallon of gas, less than all but six states. Costs also were kept down by a close proximity to the nation’s largest oil refiners, Louisiana and Texas. One year ago, gas cost $3.30 a gallon in the state, compared to an average of $3.42 nationwide. At that time, gas prices in 12 states were cheaper than in Alabama. Since then, the state’s prices have risen by only 24 cents per gallon compared to a national average increase of 36 cents per gallon, making gas in the state far cheaper relative to the rest of the United States. The state helps keep costs low for drivers by limiting gas taxes. The state’s excise tax of 16 cents a gallon is among the lowest in the county. As of the second quarter of this year, no state was cheaper to live in than Tennessee. One major reason for the state’s low relative cost of living was its low transportation costs, despite starting 2012 with four consecutive months of gas price increases. Although the state has just one refinery, the price of gas is 24 cents per gallon below the national average. In the past month, gas prices in Tennessee have fallen by 12 cents a gallon, one of the largest decreases in the country. Texas is the nation’s largest oil refiner, processing almost 4.66 million barrels per day -- more than a quarter of the nation’s output -- in its 26 operating refineries. Like Louisiana, the state further helps keep gas prices low by not charging any state taxes aside from a 20-cent excise tax. Two of the largest public companies in the nation, Exxon Mobil Corp. and Phillips 66, are Texas-based oil companies. Click here to read the rest of the list at the 24/7 Wall St. website.